Iran’s president Mahmoud Ahmadinejad on Tuesday declared his country had succeeded in enriching uranium, a development the United States described as a step in the wrong direction. The announcement came midway through a 30-day timeframe that the United Nations Security Council gave Iran to end all work towards enrichment. 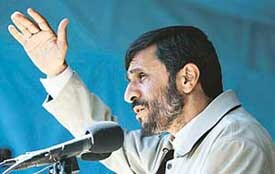 Iranian President Mahmoud Ahmadinejad speaks to the people of Torbat-e-Jam, near Mashad, about 900 km east of Teheran, on Wednesday, declaring that Iran had enriched uranium. Is the govt right in demanding snooping rights over SMS and e-mail messages? As the fury of Meerut people spilled on to the roads today,the state government finally woke up and removed the administrative top brass, including the DM, the SSP, the SP and the ADM (City). In a major embarrassment to the Maharashtra Government, the Bombay High Court today overturned a decision to ban dance bars across the state. The Punjab Chief Minister, Capt Amarinder Singh, today categorically rejected the demand of Rs 50 as bonus on wheat. Family members of Sarabjit Singh, who is on death row in Pakistan for alleged spying, today met with President A.P.J. Abdul Kalam to seek his intervention to save him from execution. Twenty-two days after he raped a German tourist, son of a top IPS officer was today sentenced to seven years’ rigorous imprisonment in yet another expeditious conviction in Rajasthan. Bollywood actor Salman Khan will have to spend yet another night in jail here as his plea for bail and suspension of five years imprisonment for killing an endangered animal will come up for hearing tomorrow. Kannadigas took to the streets here stoning and burning buses and cars even as the city slipped into a state of mass hysteria following the death of Kannada film industry icon Rajkumar who died of cardiac arrest at his residence in the city this afternoon.